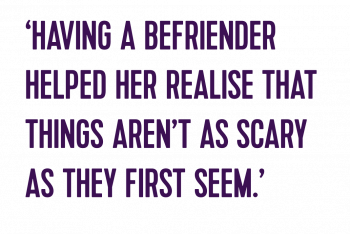 Lauren was a befriender with North Lanarkshire’s Befriending Project from 2017 – 2018. ‘At the beginning of last year I decided that I should do something worthwhile in my spare time, and began looking for a voluntary position. When I came across the project I knew it would be the perfect fit. I’m a student at university so I was looking for something that would only be one day a week. The opportunity to help a young vulnerable position appealed to me greatly. I was matched with a young girl who had health complications and disabilities, and suffered from anxiety and low self-esteem. From the first day I met my young person, I knew we would get on well. I was slightly worried about our first meeting, as I expected her to be shy and reserved, but she opened up to me almost instantly. As I got to know her, I found that children her age made her most nervous, but as the months progressed I have seen her flourish and come into her own, particularly around other children. During our first few outings she would not talk to other kids, however, by the end she was happy to engage with other people her age when we were out. My young person told me she saw me as the older sister she never had, and felt that she could confide in me and come to me for advice if anything was bothering her. We went on outings every two weeks, which we quickly learned to schedule around our busy lives. Having something planned always gave both of us something to look forward to. Both myself and my young person came up with some brilliant ideas and we went on a number of trips; the cinema, roller disco and going out to eat were definitely some of our favourites. We also went to a few of the group outings organised by the project, such as a cooking class, which gave her an opportunity to get to know some other young people.